Pete Marsh Art - Music > Black Sabbath, The End. Many, many years ago I bought my first single, it was called Paranoid by Black Sabbath..a band from my native city of Birmingham. I lent it to a friend and never got it back! That must have been around 1970 when I was about 14 years old. 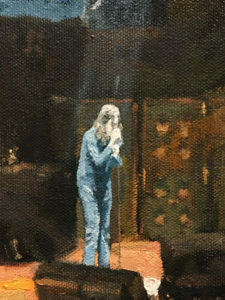 On Sunday (so fitting that it was the Sabbath day) 22nd January 2017 I went to Manchester Arena to see Black Sabbath perform as part of “The End” tour and of course to study them for a painting. Throughout a gig I am constantly looking at posture, lighting, the effects of chiaroscuro, composition, colour and all the time trying commit to memory the feelings coursing through venue. 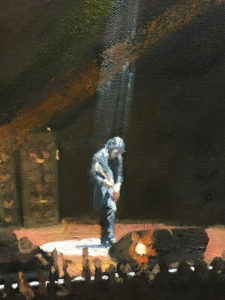 Ozzy, Tony Iommi, Geezer, Tommy and Adam did not let us down…I knew that there was a painting in me from this gig…sometimes due to lighting or other visual conditions there is no painting. 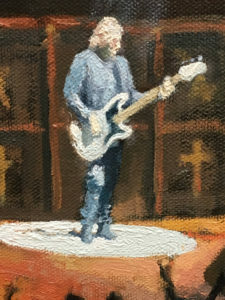 To be honest there may well be three paintings that could be inspired by this gig along with an etching…but for now here are small details from my oil on canvas titled, “The End”. See under Music/Painting for the full version.